The holiday season is nearly here! It’s common around this time of year to loosen the purse strings and splash out. After all, what are holidays for if not to spoil ourselves a little? That said, managing holiday spending can be tricky and it can be hard to avoid unexpected costs that arise. As you finalise plans for your vacation, think about how you can free up some extra dollars. Whilst relaxed on holidays, it’s often tempting to impulse buy, and this is much easier when you have easy access to your savings account or your credit cards! 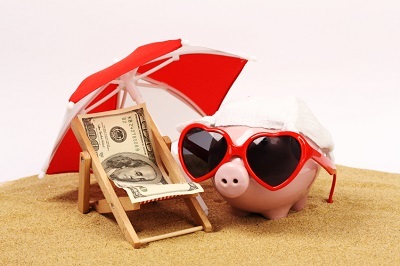 If you have a tight budget, you might wish to open a separate account that holds the amount of money you are intending to spend whilst on vacation – or perhaps even slightly less – so that you know you have a buffer. Once your holiday’s over, you could even keep this account open as a holiday-planning fund for your next trip. Travelling overseas? You may be entitled to tax concessions under the Tourist Refund Scheme where you purchase items close to the time of travel. This applies to certain goods you buy in Australia and take out of Australia. Your total purchases must be over $300 and bought within 60 days of travel and you’ll need your receipts as proof of purchase. So, if you have been considering buying a new phone or tablet, and you’re planning to go overseas soon, perhaps now is the time. For more information click here. Travel money cards are a convenient way to carry money and use foreign currencies whilst travelling and can help provide certainty around holiday spending. Funds held on travel money cards are fixed into an exchange rate the day you purchase the card, meaning that you can plan with confidence. If you are travelling to multiple countries, you can also add several different currencies to your card, instead of clogging up your wallet with different denominations of cash. The card can be used online and in-person and usually can be accessed from a wide range of ATMs worldwide. Some cards also have benefits attached such as earning reward points, which could be used to pay for other holiday expenses. Plus the travel money card is not linked to your savings account, which means if it gets stolen you are less likely to risk your savings. The fees on these cards tend to vary and some charge commission on the currency change, so it is worthwhile to do some research before making a decision. Before you leave, think about whether it’s worth your while suspending memberships and services, particularly if you’re planning a long holiday. It is likely that you won’t be using several of the services you normally would access from home, whether it’s your utilities, internet or your gym membership. Depending on your circumstances, it may also be worthwhile suspending private health insurance if you are well covered by travel insurance. And be careful to double-check your mobile phone talk and data arrangements to ensure no nasty surprises! Whether you are travelling domestically or internationally, flight costs inevitably differ based on the days and times you choose to travel. Domestic flights are commonly cheaper mid-week and prices for international flights can change based on varying factors such as events happening at the destination country around the time of your arrival. Do your research; significant savings could be gained from changing your travel dates by just a few days. If you’ve been collecting reward points from credit card spending, check to see what discounts are available to you. These might result in savings for your holiday, for example, upgrades or discounts on flights, accommodation, dining or car hire in certain cities and give you extra cash for that one thing that you just can’t do without. After a long working year, your vacation certainly should not be spent ‘checking the books’ or worrying about every little cost. Tying up your financial loose ends for the year, along with having a clear budget and using the tips listed above should make for a stress-free holiday season. Here is a video for some inspiration.